Unlike other members of the Bunyaviridae family, which must be regarded as arboviruses1, hantaviruses are not transmitted by arthropod vectors, and are exclusively maintained in the populations of their specific rodent hosts. Thus, the prefix “Robo” (from ROdent-BOrne) seems to be more appropriate for the viruses constituting the genus Hantavirus 2. Each of the over 20 currently recognized hantavirus species is predominantly associated with one (or a few closely related) specific rodent species in which it establishes persistent infection. The fact that rodents, or more specifically, rodents alone, constitute the entire host range within which hantaviruses evolve, has several important consequences: (a) Distinctive characteristics of different hantaviruses are formed as adaptations to the distinct genetic environment of their rodent hosts; (b) Contemporary distribution of distinct hantaviruses reflects complicated history of co-speciation events and rodents’ migrations (the most recent extensive rodent migrations were caused by the sequence of several glaciation and deglaciation events in the northern hemisphere). This forms a basis for the circulation of distinct hantaviruses on different continents, their co-existence in some geographic regions, and geographical clustering of hantavirus genetic variants; (c) As a general rule, humans are merely evolutionary “dead-end” hosts for hantaviruses, and thus, human epidemics do not contribute to virus evolutionary process3. As humans are usually naive towards hantaviruses as antigens, that results in sometime dramatic immunological “excesses” leading to high mortality of known hantavirus-caused diseases, severe hemorrhagic fever with renal syndrome (HFRS) (up to 10–12%) and hantavirus pulmonary syndrome (HPS) (up to 40–50%). In fact, members of the family Bunyaviridae may display alternative survival strategies, depending on the nature of their specific host organisms, e.g., the plant-infecting tospoviruses are not true arboviruses either. For the sake of simplicity, throughout this review we will be discussing rodents as the natural hosts for hantaviruses without attempting to resolve the exceptional case of the Thottapalayam virus, which was isolated from a shrew, Suncus murinus, in the 1970s (Carey et al. 1971). 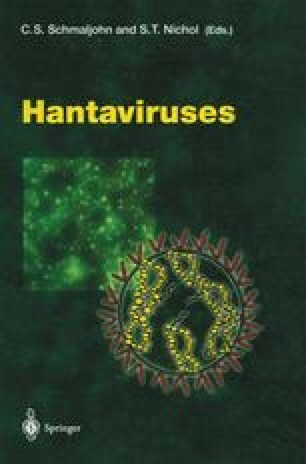 Considering the extremely high mutation rate and adaptability of RNA viruses, we cannot exclude a possibility of emergence of novel hantavirus strains with altered pathogenicity and increased transmis-sibility as a result of a human outbreak of a hantavirus disease in the future. As for now, at least one hantavirus has been convincingly proven to be capable for “human-to-human” transmission (Padula et al. 1998).